Just two days after a huge Tyrannosaurus rex terrorized Victoria’s Beacon Hill Park, a massive stegosaurus wandered into the city and made an almighty mess of the Fernwood neighbourhood while foraging for leafy greens. Bearded hipsters dove for cover and scrambled to upload Instagram photos as the dinosaur’s foot came down on their prized hangout, the Cornerstone Café. Meanwhile, wide-eyed vegans in wool skull caps and thrift store togs poured from homes to check on their tomato cages and window-box herb gardens. As the wayward stegosaurus made its way toward Government Street, onlookers noted that it had a vacant look and a dopey grin. I’m guessing someone in Fernwood will be rather dismayed to find his container garden of “medicinal marijuana” chomped to the roots. 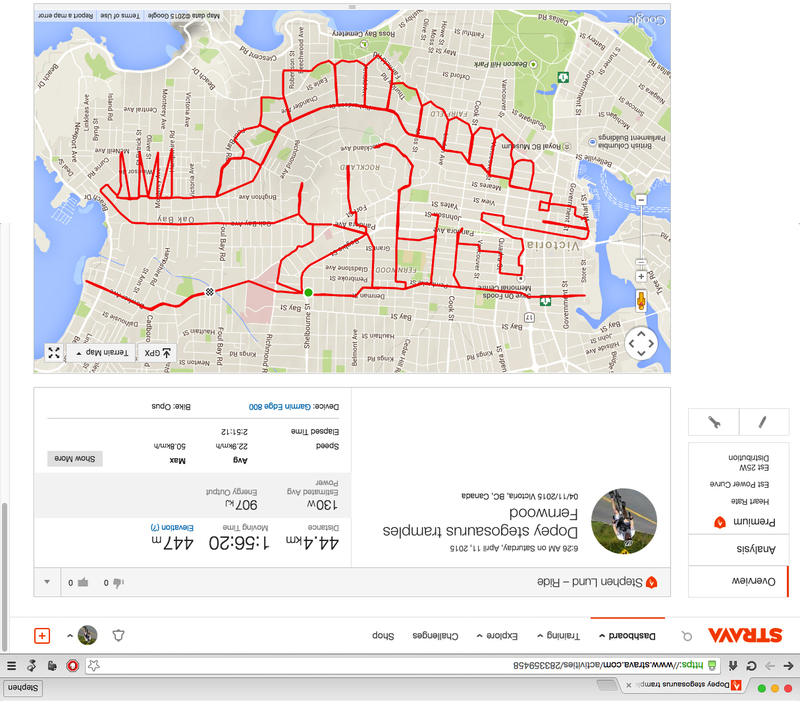 This entry was posted in gps art and tagged creativity, cycling, dinosaurs, Fernwood, garmin, gps, gps art, stegosaurus, strava, strava art, victoria bc. Bookmark the permalink. How many km. was this creation? 🙂 I don’t register/subscribe to Strava. Yes, well lazy me as a cyclist who is recovering from a head injury. Hey Jean – for this one I clocked 44.5 km. Sorry to hear about your head injury. Was it cycling-related?